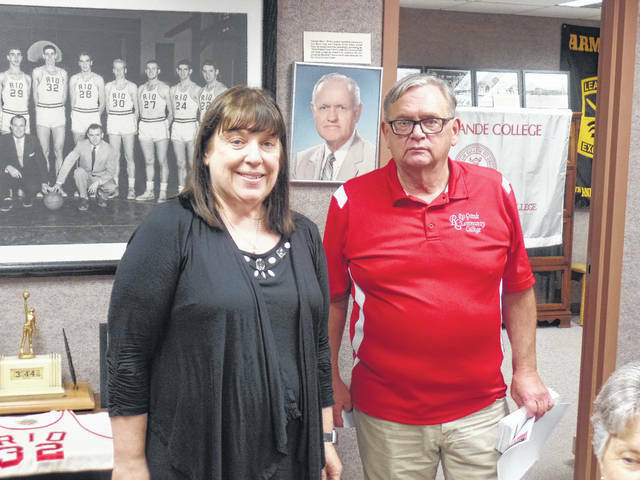 Pictured is DKG President Lynn Arnott on the left with Jake Bapst, author of “Here’s to Old Rio” on the right flanked in behind by pictures of Rio alumni and coach Newt Oliver and Rio’s basketball team made famous by record-setter Bevo Francis. 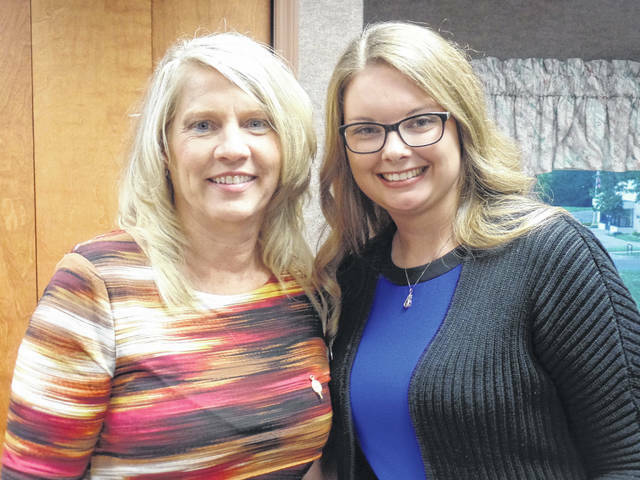 Pictured is DKG Scholarship Committee Chair, Karen Waugh, on the left and scholarship recipient, Maggie Bostic, on the right. RIO GRANDE — The Beta Alpha Chapter of the Delta Kappa Gamma (DKG) met at the Esther Allen Greer Museum on the campus of the University of Rio Grande (URG) on September 9. President Lynn Arnott called the meeting to order. Cathy Greenleaf gave the blessing. After the meal, the members were encouraged to examine the pottery on display in the museum before moving upstairs to the archives. Maggie Bostic was recognized as the recipient of the DKG scholarship. She is the daughter of Brett and Tiffany Bostic. Bostic attends the URG and is majoring in Middle Childhood Education. Following the business meeting, Jake Bapst was introduced as the guest speaker by Arnott. He began by reminding everyone that the upcoming Rio Grande Community College levy on the November ballot is a renewal levy that was first passed in 1974. Dr. Michelle Johnston, President of URG and RGCC, he said had asked him to send her regards and regret that she could not be in attendance. While doing research for his latest book, Here’s to Old Rio, Bapst organized the URG Archives. He gave an overview of what could be found there. He also shared many anecdotal stories that he had encountered along the way during his research and while organizing the records and memorabilia for the archives. Bapst explained that Jean Cooper came to URG in 1948 and was one of the longest to be employed at the college, therefore, the archives bear her name. The URG Archives may be visited on Monday – Wednesday from 10 a.m. to 3 p.m. or at other times by appointment. He concluded with a history of how URG came to be and attributed its existence primarily to Permelia Attwood which he thought a room full of women educators would appreciate. Several members were awarded door prizes with Dallie Forgey, Mary Withee, and Sandy Perry each winning a copy of Bapst’s book. The meeting concluded with the singing of the DKG Song. Members were then free to tour the archives at their leisure. DKG is a professional association of women educators whose mission it is to promote the professional growth of women educators and excellence in education. DKG members in attendance were: Josie Bapst, Lynn Arnott, Amilda Noll-Thompson, Mary Withee, Deborah Kerwood, Helenlu Morgan, Cathy Greenleaf, Jane Ann Slagle, Karen Waugh, Bambi Roush, Lisa Schwall, Sandy Perry, Dorothy Ruff, Debbie Rhodes, Karen Wright, Dallie Forgey, Beth James, Linda Donohue, Vickie Powell, Lois Carter, Janet Baker, Anita Fisher, Donna DeWitt, Nancy Hood, Barb Burnette, Beth Hollanbaugh, Patsy Schuldt, Emily Dailey, Darlene Ringhand, Doris Lanham, Dian Callahan, and Patty Young. Guests in attendance were Jake Bapst and Maggie Bostic.